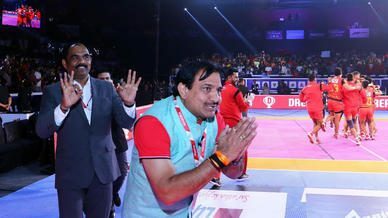 A quality outing for Dabang Delhi K.C.’s raiders helped the team win their third straight game at home after a narrow 32-31 victory over Bengaluru Bulls at the Thyagaraj Sports Complex in Delhi. 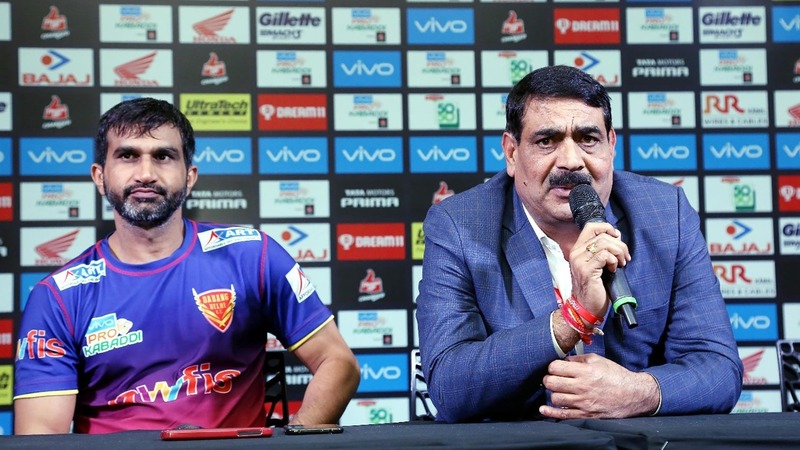 In the post-match press conference, Dabang Delhi K.C. 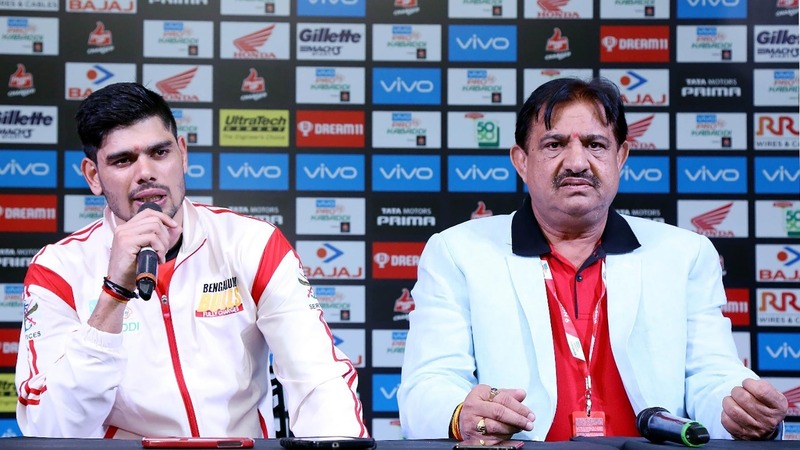 coach Krishan Kumar Hooda and Joginder Singh Narwal took questions for their side, whereas Bengaluru Bulls were represented by coach Randhir Singh and captain Rohit Kumar. Q. Thoughts on the performance? Krishan Kumar Hooda: I am overjoyed with the performance. It was perfect. If you play well at home, you are bound to do well. I would also like to thank the fans. Their support has been overwhelming. With the backing of our fans, we will continue to do well. Q. What is your preparation like for the Playoffs? 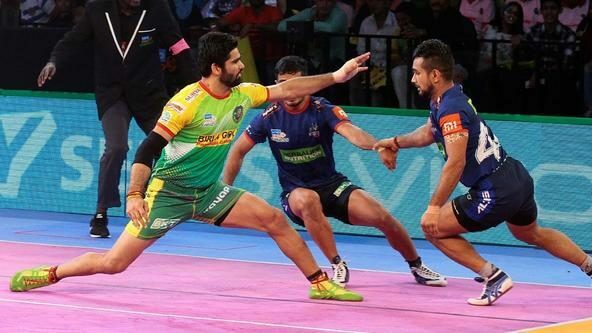 Joginder Singh Narwal: We aren’t even through with our home leg, the playoffs are far off. We aren’t concerned about that yet. We’ll think about it after we’ve qualified. Q. Thoughts on your chances of going all the way? Krishan Kumar Hooda: If you assess our fixtures, I think we’ve been comprehensively beaten only twice. So, we’ve managed to keep it close in almost all our matches. We’ve won some and lost some. In the Playoffs, it’s all about who makes fewer mistakes. Q. Thoughts on the match? Randhir Singh: I was born and bought up in Delhi and played for Delhi as well. 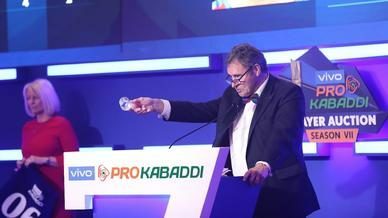 But as a coach in VIVO Pro Kabaddi, I’ve found it impossible to win here. When Pawan Kumar Sehrawat scored two bonus points towards the end, I told him to try and get a touch point as well. We started off poorly and in trying to compensate, we kept making uncharacteristic mistakes. Q. Did you think you could come back? Randhir Singh: Yes, and we almost did. We fell short by one. But it wasn’t meant to be. The rally towards the end was magnificent though. Had we taken a touch when I asked Sehrawat to, we could have tied, if not won the match. Q. Did the defence let you down? 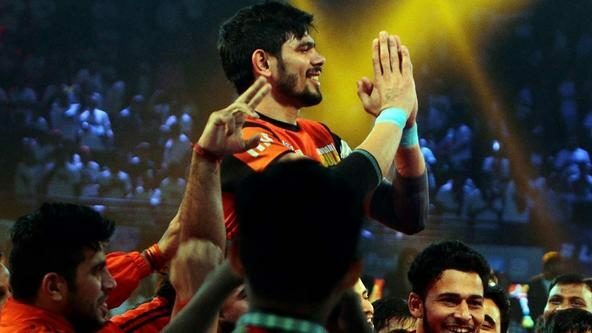 Rohit Kumar: Like the coach emphasized, we couldn’t settle into the contest early on. And giving up a seven-point lead midway through the first half didn’t help our cause either. In trying to overcome that, we made some bad plays. Q. What are the plans going ahead? Rohit Kumar: The aim is to top the zone. We have five games left and we’ll try to win them all. We need to listen to the coach’s instructions and implement them on the mat.